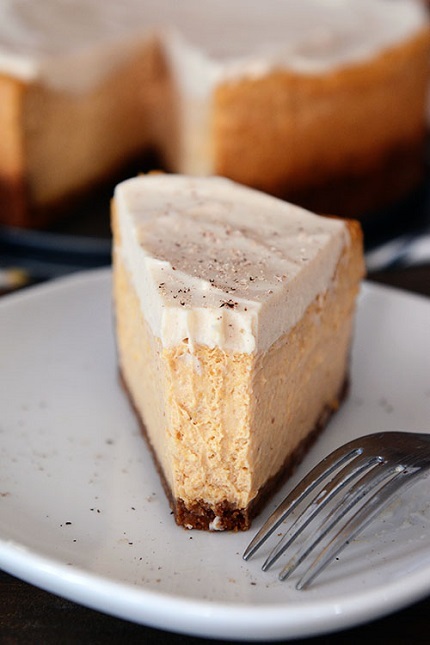 Based on this ethereal, amazing Vanilla Bean White Chocolate Cheesecake, this egg-free, pumpkin version you see before you today is so creamy, so luxurious, so delicious, it kind of blows my mind. 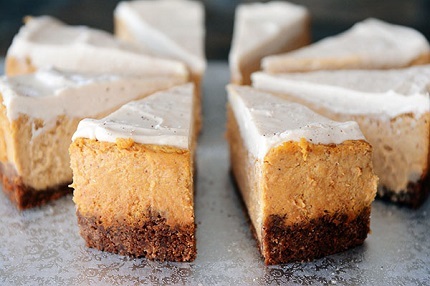 When I set out to make a lightly spiced, seasonal pumpkin cheesecake, I didn’t realize it would skyrocket to the top of my favorite cheesecakes of all time. Which is saying a lot since I love me some cheesecake. Perfect for a decadent fall dessert on any given day, it would also make a very special addition to your Thanksgiving menu* (is anyone planning yet or are you cringing and curling into a quivery ball at the thought?). It doesn’t hurt that the silky, creamy, pumpkin cheesecake is topped with a rich white chocolate mousse layer. Such extreme yumminess, it isn’t even funny. If you only have a 9-inch springform pan, you can use it also (I've made it in both a 9-inch and 10-inch pan). Keep in mind the pan will be VERY full and it will probably take another 10 minutes of baking time for the cheesecake. For the white chocolate topping, I've given instructions for mixing with an electric mixer. If you want an alternative, I very often whip this (and other similar whipping cream/cream cheese ingredients) up in my Blendtec. I don't beat the cream separately, I just add all the ingredients except the melted white chocolate and process until thick and smooth, then add the white chocolate and mix again. Also, remember that cheesecakes are the best kind of desserts to serve for entertaining because they can be (and should be) made ahead of time. 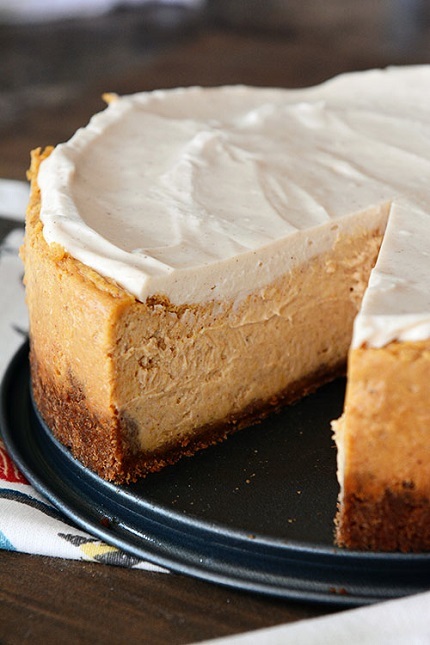 This cheesecake can be made and refrigerated for a day or so before serving.